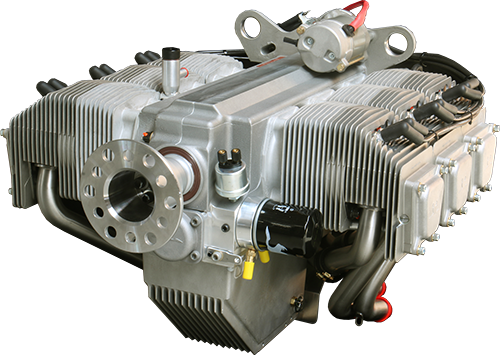 The Jabiru 2200cc Aircraft Engine is a 4-cylinder 4-stroke horizontally opposed air cooled engine. 80hp. 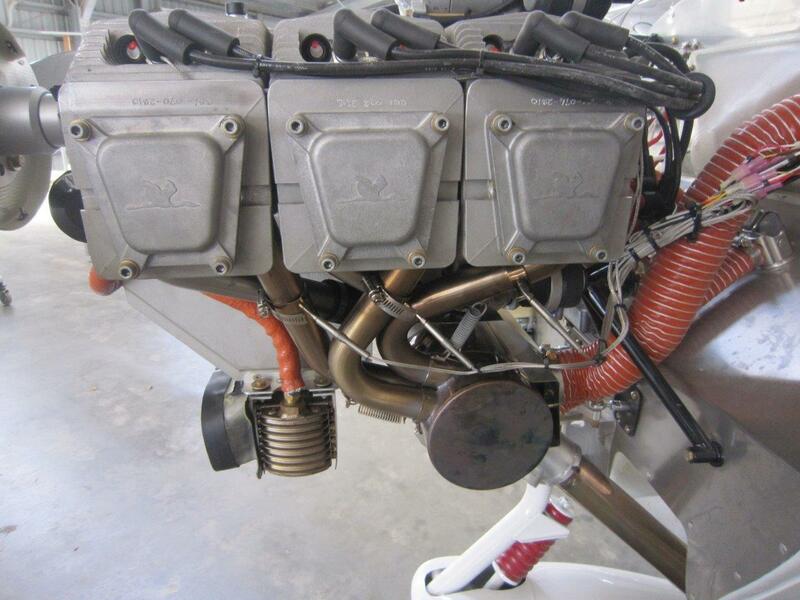 The Jabiru 3300cc Aircraft Engine is a 6-cylinder 4-stroke horizontally opposed air cooled engine. 120hp. Jabiru engines are designed to be manufactured in small batch quantities using the very latest Computer Numerically Controlled (CNC) machine tools. Majority of the components are machined in Southern Queensland in a network of small companies. The crankshaft is forged from 4140 chrome molybdenum alloy steel, the journals of which are precision ground prior to being Magna flux inspected. The crankshaft is designed with a double bearing at the propeller flange end and a main bearing between each big end. It therefore does not have flying webs. 48mm main bearings are also of the automotive slipper type. Thrust bearings are located for and aft of the front double bearing allowing either tractor or pusher installation. The propeller is directly crankshaft driven and does not use a reduction gearbox. This facilitates its light-weight design and keeps maintenance costs to a minimum. The crankshaft features a removable propeller flange which enables the easy replacement of the front crankshaft seal and provides for a propeller shaft extension to be fitted, should this be required for particular applications. The camshaft is provided by a specialist camshaft manufacturer. Cylinder heads are cast aluminium and screwed to aluminium cylinders to form a one piece assembly. There are no cylinder head bolts that are needed to be re-torqued which reduces maintenance. The cylinder barrels are electrolytically coated with silicone carbide (ceramic) in a nickel matrix. This material is very hard wearing and has low friction qualities. The aluminium cylinders have a high heat dissipation rate which is 3 times the rate of the previous steel barrels. Also the aluminium cylinder bores are non-corrosive. Con rods are forged from 4130 alloy steel, the 45mm big end bearings are of the automotive slipper type and easily replaced. An integral alternator using rare earth magnets, provides alternating current for battery charging and electrical accessory drive. The alternator is attached to the flywheel and is driven directly by the crankshaft. The ignition system is a transistorised electronic system; two fixed coils mounted adjacent to the flywheel are energised by rare earth magnets attached to the flywheel. The passing of the coils by the magnets creates the high voltage current which is then transported by high tension leads to the centre post of two automotive type distributors (which are simply rotors and caps) before distribution to automotive spark plugs, two in the top of each cylinder head. The ignition system is fixed timing and, therefore, removes the need for timing adjustment. The dual ignition system is self-generating and does not depend on battery power. Pistons are Jabiru designed. They are manufactured by a specialist piston manufacturer. They are fitted with 3 rings. Valves are 7mm (stem dia) which are purpose manufactured for the Jabiru engine. The valve gear includes push rods from the roller follower. Valve rockers are forged, through hardened and mounted on a shaft through a pressure lubricated bush. Valve guides are manufactured from bronze. Valve seats are of nickel steel and are shrunk into the aluminium cylinder heads. The valve gear is lubricated from the oil gallery via the hollow push rods. An internal gear pump, direct mounted on the camshaft and incorporating a small automotive spin-on filter, provides engine lubrication. An oil cooler adapter is provided. All installations require an oil cooler to meet oil temperature limits. The standard engines are supplied with two RAMAIR cooling ducts, which have been developed by Jabiru to facilitate the cooling of the engine and direct air from the propeller to the critical areas of the engine, particularly the cylinder heads and barrels. The fitment of these RAMAIR cooling ducts is a great bonus for the home builder or engine installer, as this obviate the need to design and manufacture baffles or establish a plenum chamber. A “cleaner” engine installation results, which in turn facilitates maintenance and inspection of the engine and engine component. So the hard work of engine installation has largely been done for you by the Jabiru design team. RAMAIR ducts are available for tractor or pusher configurations. Special ducts are available for certain installations. The engine is fitted with a 1.2 kw starter motor. The engine has very low vibration levels, however it is also supported by four large rubber shock mounts attached to the engine mounts at the rear of the engine. An optional bed mount is available. The fuel induction system comprises a pressure compensating carburettor. Following carburation, the fuel/air mixture is transported to a small plenum chamber in the sump casting, in which the mixture is warmed prior to entering short induction tubes attached to the cylinder heads. 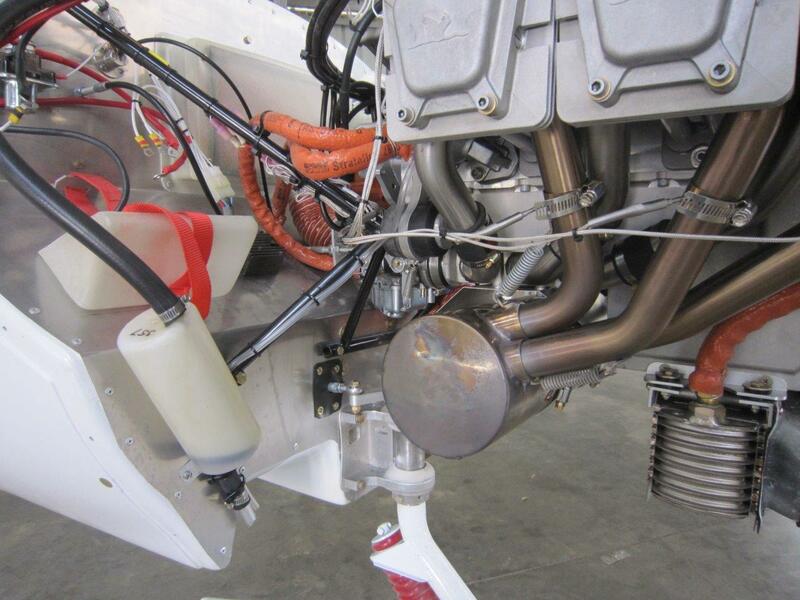 An effective stainless steel exhaust and muffler system is fitted as standard equipment, ensuring quiet operations, which in the Jabiru aircraft have been measured at 62dB at 1000′ full power flyover (for 2200 engine). Jabiru engines are designed and manufactured to ASTM F2339 and within quality assurance standard ASTM F2279 developed from Australian Civil Aviation Safety Authority (CASA) approved Quality Assurance System exacting standards. Jabiru also holds a Type Certificate for the 2200C engine and for the time period that this engine was manufactured, held a production certificate.